The Book of Memory is the culmination of the larger Memorial Room project that has been in the works for since 2014. 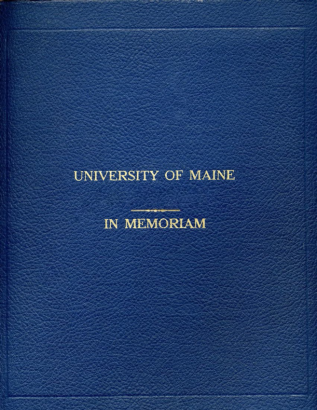 It was inspired by the original Book of Memory created by the Alumni Association in 1946 that honored and memorialized UMaine’s fallen from WWII. The existing copy of the original Book of Memory is behind a glass case and unavailable to be viewed. 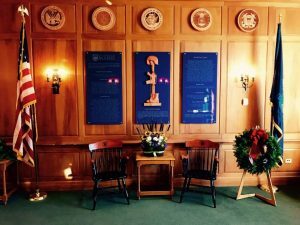 The Memorial Room presently houses three plaques listing the 262 names of UMaine fallen from all conflicts dating back to the Spanish American War along with a wood embossed battlefield cross. The new Book of Memory is an interactive document where one can see a portrait and read the biography of the fallen. The Digital Book of Memory is available for download. Please refer any additions or corrections to the the VETS office so we can update the records.